The false choice between individualism and collectivism is a dangerous mythology. That mythology grows out of the seductive diametric oppositions of the Cold War era, but also predates it, and has its roots in the aristocratic system, which held that only a few could really be worthy of decision-making authority. The struggle, then, must be of the noble individual against the opportunism of the crowd. The truth is: imaginative, forthright individuals who take initiative, but who collaborate freely, thoughtfully and effectively, are better able to meet important challenges and achieve major innovations. Collaboration does not privilege the collective over the individual, but simply demonstrates that the individual is empowered, and has a right to expect to be, by the forces of a healthy, collaborative social fabric. From September 21 through September 25, I participated in the Climate Ride, in which 186 of us rode our bicycles from New York City to Washington, DC. It would not have been possible for me to ride 320 miles in 5 days, if I had embarked on the journey alone. Even if I were granted the highly complex technology of a 20-speed, aluminum-frame bicycle, and all the necessary athletic gear, I would not have known the best route, or been able to tend to all of my own needs along the way effectively. The stress on my own time, energy and ingenuity would have been such that I would likely have run out of daylight hours, just figuring out some basic practical constraints and then actually cycling. If anything had happened, and I had no way to communicate with others, and no one nearby to lend an ear, a word or a hand, I would have had to commit all of my energies to dealing with the problem, most likely without sufficient expertise to get things right. There is no more fundamental economic principle than efficient collaboration: an ecosystem is an efficient collaboration of life-forms for collectively optimized survival. It does not require that there be no individual qualities, talents or achievements; it only provides a biological framework within which life is more likely to thrive. Life begetting life. When we build policy around the ill-conceived pretense that a society is stronger when individuals have few alliances, we build a society centered on inefficiency and dysfunction. With so much discussion about fiscal health and economic efficiency, we hear far too little about the natural efficiency of open systems and self-organizing communities. 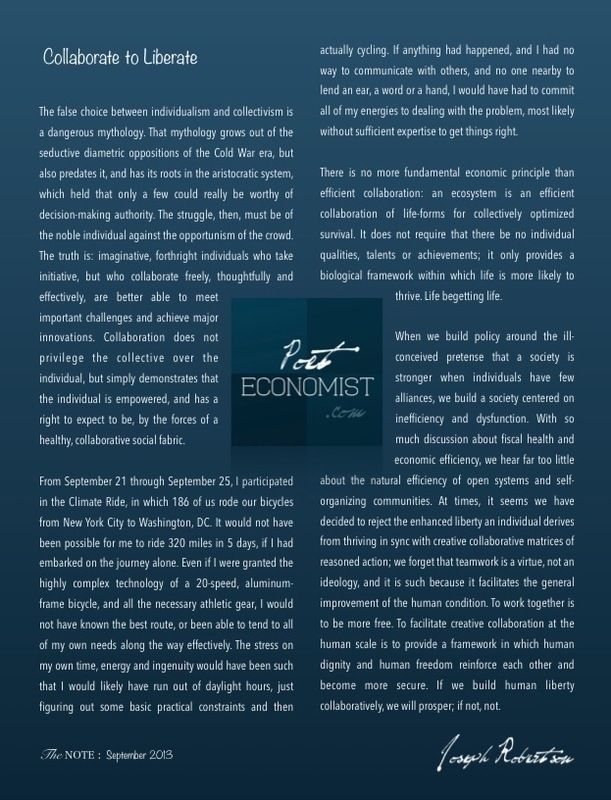 At times, it seems we have decided to reject the enhanced liberty an individual derives from thriving in sync with creative collaborative matrices of reasoned action; we forget that teamwork is a virtue, not an ideology, and it is such because it facilitates the general improvement of the human condition. To work together is to be more free. To facilitate creative collaboration at the human scale is to provide a framework in which human dignity and human freedom reinforce each other and become more secure. If we build human liberty collaboratively, we will prosper; if not, not.